This is the 2nd card we will be making in our class on Tuesday. I just love the little 'Solider from Hanna's Vintage Toy Stamps. I stamp and then cut him out with the Long Rectangle Nestie die. He was colored with Copic Markers. 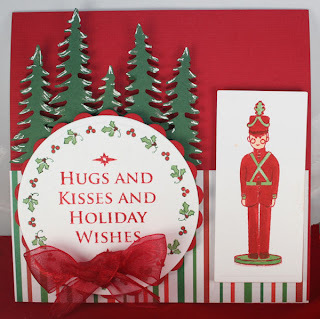 I used the JustRite Christmas Ensemble to stamp the wishes, colored the border with Copic markers and cut and embossed a scallop with my Large Round Scallop from my Nesties. The trees were cut with my Cricut Expression using the My World cartridge. I used a white gel pen to highlight the branches in white. I used dimensionals under everything and then I added a red sheer bow. I love the red, white and green stripe and would love to have more of it. Wish I could remember where I got it. Does that ever happen to any of you? Wonderful card, Joan. Love all elements and layout. Great card Joan... Wonderful Christmas colors. This card is so darling -- I JUST love it!! !